Combining live-action and animation has been around since the dawn of film itself. Max Fleischer had success with it, doing Koko the Klown with this process. Walt Disney also did it with Alice comedies, as well as Walter Lantz’s Dinky Doodle. 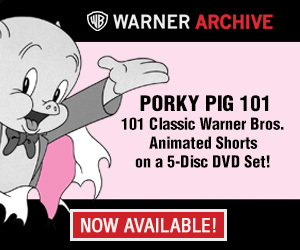 In 1940, it was even done at Warner Bros. when Friz Freleng made You Ought to Be in Pictures. Like many things, it was done in Japan as well. 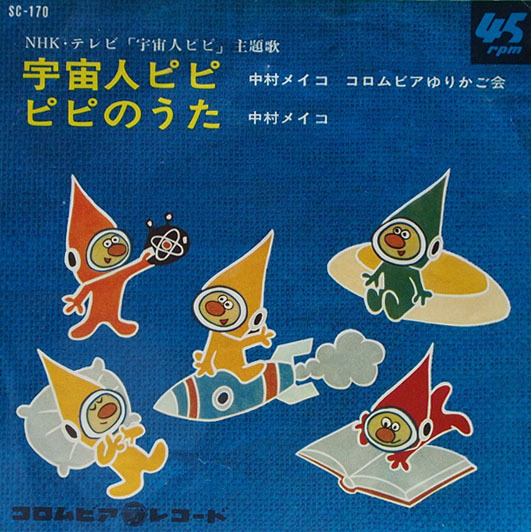 One of the first anime series broadcast on NHK (Japanese equivalent of BBC) was a black and white live-action/animation program called Uchujin Pipi (Space Alien Pipi). 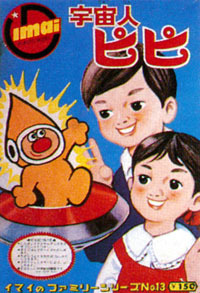 The show centered on Pipi the space alien landing in Japan. There he befriends a boy named Toshihiko, whom he moves in with at his home. Pipi is a tiny alien, about the size of a thumb, and thus Toshihiko is able to hide him from others. The only other person who knows is Toshihiko’s sister Ryoko. 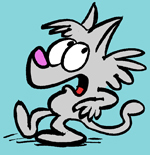 In spite of his tiny stature, Pipi comes from a planet that’s more advanced than Earth. His tiny flying saucer is filled with many devices that comes in handy in the story. In one episode, when a boy gets seriously injured, Pipi was able to make everything right by using one of his planet’s device to literally rewind the episode back to the beginning, thus preventing the tragedy. Pipi is cel animated, courtesy of Japan Tele-Cartoons, the same company that produced Marine Boy and Johnny Cypher in Dimension Zero. He was super-imposed over the live-action footage, interacting with every other character in the show. NHK broadcast the show from April 8, 1965 to March 31, 1966, airing on Thursdays at 6:00-6:30 PM for 52 episodes. The show was created and written by Sayoko Komatsu and Kazumasa Hirai. Pipi was voiced by Meiko Nakamura, who has very little animation credit (she was primarily a singer). The live-action leads were Shigeru Annaka (Toshihiko) and Fumie Hōjō (Ryoko). Yuichi Fukuhara supervised the animation. Anybody remember the live action / animated adaptation of Osamu Tezuka’s The Vampires? It certainly was strange, and took many liberties from its source. What’s the story behind these shows being lost? It’s somewhat understandable in the U.S. where live videotaped shows were often wiped for further use, but why would a filmed program be lost? I’m sure prints were used or re-used over time though Japan perhaps simply didn’t care to keep film prints if there wasn’t an interest to keep them in vaults the way the BBC didn’t care to keep the original video recordings of it’s programs. How would Pipi be able to be added onto the live action content? In a time when anime was a big thing it seems impossible.